A successful marketing strategy for small business is the roadmap to business success. It is only possible to develop a marketing strategy if the business has clear goals and objectives that it is working towards. You see many businesses will contract AP Marketing Works to develop a marketing strategy and the first thing we ask them is “what are you hoping to achieve in your business this year?”. If the answer is “I don’t know”, then we are left with little guidance to direct a marketing strategy. In fact, the strategy is lost. Instead it ends up being a plan full of marketing activity. Why this is a problem is that there are lots of options for marketing activity or tactics. Being strategic in your choice of marketing activities or tactics makes the difference between what activities will bring results. It’s similar to driving. If you don’t know your destination you can drive around all day, being busy in the car but not really achieving anything. If you know a destination you can identify the best route to get there and then let the car take you there. So why do people have trouble setting goals or a destination for their business? If having goals helps you with success then why don’t we set them? I have been contemplating this question and must admit there are times in my life when I don’t set goals. So with a bit of self reflection and some discussions with business owners, my understanding of why we don’t set goals is simply this. If you don’t set goals you can’t fail to achieve them. That’s a double negative so let’s look at it another way and take out one of the negatives. Here’s what we are left with… If you do set goals you can fail to achieve them. You see no-one likes to fail. Sometimes setting goals may feel like setting yourself up to fail and that’s why we are reluctant to do so. The bigger question is, if you don’t achieve your goals is that failure? For example if your goal was to make $1 million turnover in your business and you made $950,000 instead, is that failure? What do you think? I am pretty convinced that many small businesses would be happy with that turnover! In this case by setting a goal and working towards it you are more likely to achieve more than with no goal. What can we do to overcome our reluctance to set goals? 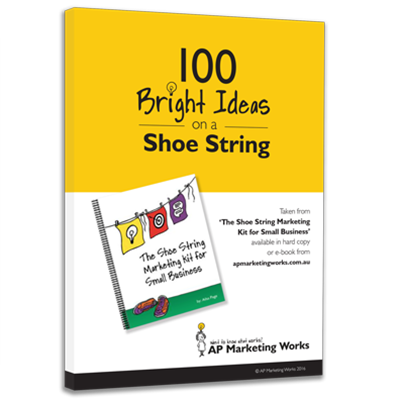 Contact AP Marketing Works if you are having trouble setting goals. We work with business coaches who can help you in that area.